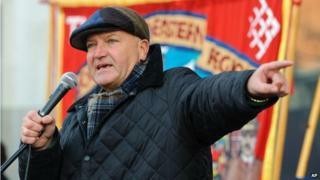 Bob Crow, who has died aged 52, was defiantly one of the old school of trades union leaders. The RMT boss opposed government ministers and Transport for London head-on, with commuters the victims as the capital's Tube or rail services ground to a halt. Only last month, a 48-hour strike was held over proposals to lay off 950 ticketing staff. The grandson of an East End boxer, apparently known as "Punch Crow", Mr Crow loved a political fight. To his supporters, the father of four was a true class warrior, one of the most effective negotiators in the UK union movement, getting good pay and conditions for his members, willing to stand up for their rights. Born and raised in east London, Mr Crow left school at 16 to work for London Transport, as part of a rail-fixing and tree-felling gang. He "fell in love" with trade union activism soon afterwards, describing his politics as "communist/socialist". His involvement in unions started when Mr Crow was 19 and got into a dispute with his section boss over duties. During the 1980s, and with Margaret Thatcher's Conservative government - to which the unions were angrily opposed - in power, he rose through the ranks of the National Union of Railwaymen. It merged in 1990 with the Seamen's Union to become the RMT (Rail and Maritime Transport union). In 2002 Mr Crow was elected general secretary, in which job he became one of the best known union leaders in the UK. His union fell out with new Labour and axed its affiliation to the party. He fought politicians of both Left and Right unremittingly. In 2006, he and his followers heckled Tony Blair as he spoke at the TUC conference. They staged a walk-out in 2010 when Bank of England governor Sir Mervyn King addressed delegates, Mr Crow declaring: "I've got other things to do." In particular he clashed with London mayors Ken Livingstone and Boris Johnson over changes to pay and conditions on the London Underground. Mr Crow, a Millwall supporter, often appeared in the media, never ceding an inch to his opponents. One politician who certainly was not fond of him was Mr Johnson. The two men were not even on speaking terms in recent years, apart from a testy LBC phone-in last month, after the union leader, calling himself "Bob from Woodford Green", dialled in to ambush the mayor. Hearing of his death, Mr Johnson said: "I'm shocked. Bob Crow was a fighter and a man of character. Whatever our political differences, and there were many, this is tragic news." Mr Livingstone, another man of the Left, said: "He fought really hard for his members. The only working-class people who still have well-paid jobs in London are his members." But Mr Crow's class-based politics made him a regular cartoon villain for some newspapers. His salary package of about £145,000 was criticised, especially as he continued to live in a council house. Mr Crow took plenty of flak when he went on holiday to Rio during the negotiations that led to last month's Tube strike, pictures showing him sunning himself on Copacabana Beach. But he defended his actions, saying he would not have taken part in the last-ditch talks, even if he had remained in the UK. "What do you want me to do?" he asked. "Sit under a tree and read Karl Marx every day?" Under Mr Crow's leadership, the RMT's membership increased by more than 20,000 to 80,000. Labour leader Ed Miliband said he had been "loved and deeply respected by his members", adding: "He did what he was elected to do, was not afraid of controversy and was always out supporting his members across the country." In a pre-recorded interview broadcast on Monday on BBC Radio 4's PM, Mr Crow said: "At the end of the day, as general secretary of a union, you've got to be larger than life. "You don't want to mooch around in a grey suit and eat a sandwich every lunchtime. You want someone with a bit of a spark about him."